The RV Doctor: Winter RVing! With some proactive preparation, you can continue to enjoy the RVing lifestyle even in the cold and snow. 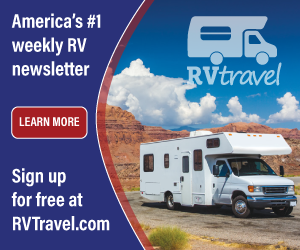 While most coach owners who live in cold-weather locales either head to warmer climates for the winter or park the RV for the season, there are those brave souls who still do go RVing even during wintry conditions. Then there are the full-time RVers who simply refuse to head to Florida or Arizona, instead deciding to visit extended family in the northern climes. If you’re the audacious type, winter RVing is not only doable but also encouraged! Take the necessary precautions, such as staying tuned to a reliable weather forecasting source, and make sure all your safety devices have been tested and verified, and you should be able to enjoy your RV in even the chilliest winter weather. Like those who store their units when the weather turns frigid, RVers who decide to “winter” IN their coach must make preparations to assure the vehicle is capable of operating effectively in harsh conditions. What follows is some useful information to help make that wintry trek comfortable. If you will be using the RV throughout the winter months, there are a couple schools of thought about how to protect the fresh water system. 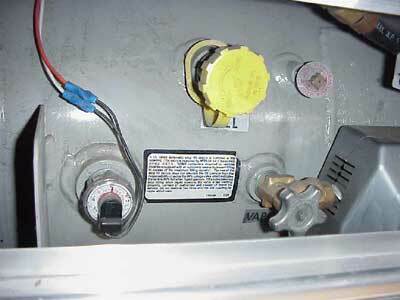 If your coach is well-insulated and the plumbing lines are run through heated sections of the RV, then it may simply be a matter of ensuring the tank, the water pump, and all associated plumbing remain in temperatures above freezing. Easy to accomplish with just the furnace though you may have to open cabinet doors to be sure the comfort heat reaches the plumbing lines. Some RVers still drain all the fresh water from the system and simply use bottled water for cooking, doing the dishes, flushing the toilet, etc., and rely on the campground accommodations for showers. But with certain precautions, it is entirely possible to continue to use your on-board fresh water system throughout the winter, though it’s wise to have a few gallons of bottled water on hand just in case. Begin by performing a detailed inspection to determine where and how the fresh water tubing is routed throughout the RV. It’s not uncommon to find the tubing run inside cabinets, above the floor, to all the fixtures. But oftentimes, manufacturers route the tubing inside storage compartments or perhaps underneath the RV for short distances. Try to visually locate every inch of the hot and cold lines. Split foam insulation tubes can be purchased at home improvement stores and easily slipped over exposed tubing. Extra insulation also can be placed around the water pump if it is located in an unheated compartment. Just be careful to allow air space around the motor portion of the pump to keep it from overheating during use. 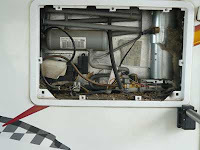 If your RV’s plumbing bay is not heated (most modern coaches, especially motorhomes, do have heated plumbing bays), it may be possible to modify the compartment so that heated air from inside the RV can be directed into that compartment. In some cases, the hot air distribution box of the furnace may be equipped with an unused duct outlet that can be tapped into and routed to the plumbing compartment. At the very least, a drop light with a 60-watt bulb should sufficiently warm the fresh water plumbing bay. 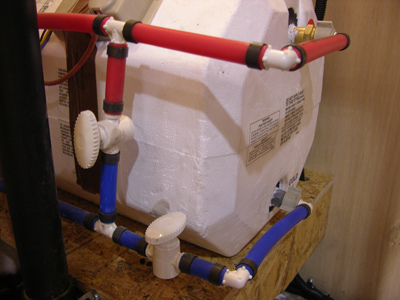 If necessary, aftermarket heating blankets and heat tape also can be used to keep the water tank and other sections of fresh water tubing warm. Not every RV will be identical, so the inspection and method of protection will vary from coach to coach. Leaving cabinet doors open or utilizing small circulating fans will help distribute the heated interior air into and around the majority of fresh water components. Prolonged periods of temperatures below freezing may hamper the use of a city water connection, but if the temperatures allow it, heat tape and split foam insulation can be employed to some degree of success. I recommend thermostatically controlled heat tape, just to be safely protected. Continue to use the water heater in the same manner as always. Using the electric heating element instead of the propane gas flame, if so equipped, will help conserve the supply of propane, but keeping the heater “on” all the time will eliminate any freezing concerns. You still may have to add foam insulation to the hot water tubing inside the RV, but the water heater itself will be safely protected. If you plan to utilize the waste system (black and gray tanks) as you travel in colder climates, the aforementioned tank blankets and heat tape are available to protect your waste plumbing in freezing weather. Heaters are also available for each dump valve to keep them freezing shut. These will probably be necessary if your holding tanks are exposed underneath the RV. 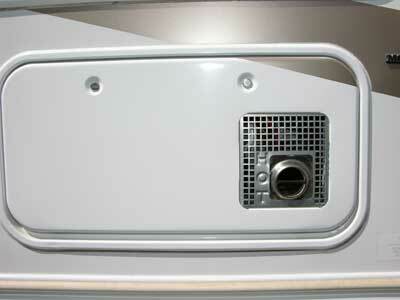 For tanks mounted in compartment bays, typically they will have access to heated air anyway. If not, just like the fresh water tank, a 60-watt drop light should do the trick. 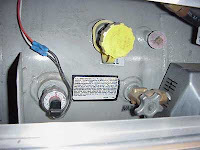 Keep all holding tank termination valves completely closed and periodically add a half-gallon of RV antifreeze as you continue to use the holding tank. As a less expensive alternative, windshield washer fluid can be substituted for RV antifreeze if it is permissible in your locales. Evacuate the tanks often if possible to prohibit the contents from freezing. Carefully warming the holding tank valves with a common hair dryer will unfreeze stubborn valves in really cold weather. Avoid keeping the sewer hose connected all the time. Wait until it’s time to evacuate the tanks and then use the sewer hose. Keeping the hose clean and dry will help prevent residual water and waste from freezing and causing a possible blockage. During an extended campground stay in subzero weather, you may consider using a section of rigid Schedule 40 ABS drain pipe with the necessary adapter fittings and forgo the flexible sewer hose altogether. Consider yourself fortunate if your RV was constructed to cold-weather standards using higher R-rated insulation and dual-pane windows. If your coach maker did not utilize dual-pane windows, you can always upgrade. 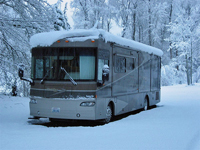 This would be a wise choice if you choose to use your RV during the winter often. Proper air movement is paramount to minimizing the inevitable collection of moisture where thin walls and single-pane glass windows collide with severe temperature differences between the air inside and outside the RV. Instead of using 1-inch Styrofoam panels to cover the window glass, as I suggest for winterizing and storing, consider a transparent or tinted, thin plastic film. It will add a bit to the R factor yet still allow viewing through the windows. 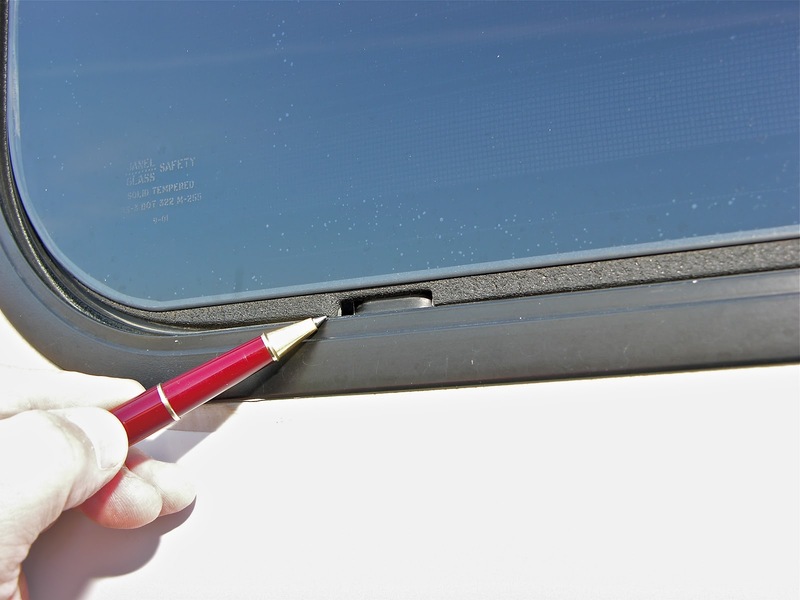 Inspect each exterior window frame and be sure the weep holes are not plugged. 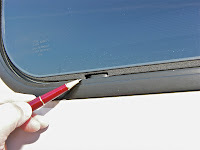 Some windows have small plastic covers over the weep holes, while others do not. Remove those plastic covers to verify each weep hole is clear of debris. Consider replacing a rear-mounted, 14-inch roof vent with a powered air exchanger. 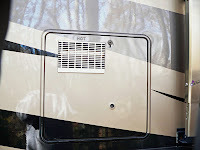 Running the powered vent fan periodically while leaving another window cracked open on the opposite end of the coach will create a small, convection-like turbulence inside the RV that will help minimize the accumulation of moisture. Place foam blocks inside the remaining 14-inch roof vents and skylights. Aftermarket vent opening covers that attach to the ceiling are also available and recommended. Also, be sure to unlatch the range hood vent flapper on the exterior so auxiliary air exchanges can occur by operating the range hood exhaust fan. You’ll want to keep that air moving. The same goes for the lavatory when showering or bathing. Put that powered vent to good use to exhaust as much moisture as possible. Place throw rugs over non-carpeted flooring sections. Besides keeping your feet warmer, they will help insulate that floor section and cut back on the amount of energy required to keep the interior comfortable. You also should consider using an insulated windshield cover if you have a motorhome. This will minimize the loss of heated interior air through the glass. You’ll definitely need your appliances — furnace, water heater, cooktop/oven and refrigerator — at some point, so you’ll be utilizing the propane gas system normally. Well, as “normal” as possible. Allow me to explain. Just like boiling water, it takes heat to vaporize propane. 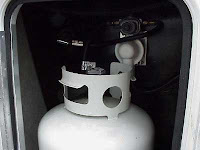 We store the propane as a liquid in the container, but we burn propane as a gas at each of the appliances. To get the liquid propane out of the container, regulated, and delivered to the gas appliances, it must first become hot enough to vaporize. Take, for instance, a properly filled 100-pound propane container. At 70 degrees Fahrenheit, the propane will vaporize at a rate of 120 cubic feet per hour (a lot!). This equates to about 300,000 Btu per hour. But at 0 degrees Fahrenheit, the vaporization rate is reduced to only 113,740 Btu per hour for the same amount of propane in the tank. If that 100-pound container was only 10 percent full and the temperature was 0 degrees Fahrenheit, the rate of vaporization is further reduced and will be able to deliver only 25,750 Btu hours, approximately. So, the colder the temperature and the emptier the tank is, fewer Btu hours will be available. The size and design of the propane container also can contribute to its ability to vaporize the liquid propane. A longer tank with a smaller diameter is actually better at accommodating the rate of vaporization in colder climates than a fat, shorter tank. This is due to the greater number of square inches of tank surface in contact with the propane as compared with a same-sized tank that is shorter but larger in diameter. So, what does this all mean? 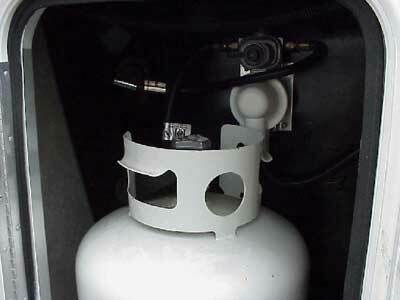 Well, if you’re planning to operate the appliances during winter excursions, always begin with a full propane container(s) before heading out, and try to refill before the fuel level is reduced to below a third full. Also, try to conserve fuel whenever possible. Use the aforementioned portable electric space heaters for comfort heating. Likewise, run the refrigerator and water heater, if so equipped, on 120-volt-AC when possible. Take the time to “do the math” regarding the four propane-burning appliances in the RV to determine the actual Btu demand. Charts are available that enable you to estimate, based on your demand, how many Btus per hour will be delivered to the appliances at varying temperatures. You may have to become judicious in your use of the appliances in extremely cold weather. The one appliance that you definitely will need during cold-weather travel is the furnace, and you will need it to be operating most of the time. So, be cognizant of the amount of propane left in the container. Compute your Btu demand and know how much fuel the furnace consumes each day. The forced-air furnace is also a heavy user of 12-volt-DC power. This is usually not a concern if you’re plugged into 30-amp or 50-amp electrical service, but it is crucial if you’re dry camping without hookups. Take the time to determine the amperage draw of the furnace system in the RV and try to estimate how many hours per day the furnace will be operating. Then do the calculation to see just how much battery storage capacity you’ll need. As mentioned earlier, using portable space heaters whenever shore power is available will not only help conserve propane gas, it also will keep that battery bank charged. Using electric blankets on your bed at night also can help conserve fuel, as it allows you to lower the furnace thermostat. The absorption refrigerator, however, may experience other issues. In extremely low temperatures, the refrigerator simply may not operate. The internal contents of the sealed absorption system include water, liquefied ammonia, hydrogen gas, and sodium chromate, the chemical used to protect the internal pipes from the corrosiveness of the ammonia. During a typical cycle, heat is applied by either an electric heating element or a propane burner. During the process of removing the heat from inside the refrigerator and freezer (the absence of heat is cold), the water and liquid ammonia are boiled and evaporated, then condensed back into a liquid over and over. And since water freezes at 32 degrees Fahrenheit . . . well, you can begin to see how very low temperatures can have an effect on absorption refrigeration, just as much as extremely high temperatures. 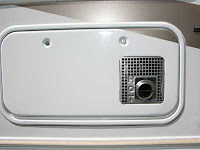 The cooling core is attached to the rear of the refrigerator, not within the heated house portion of the RV. Temperatures below 10 degrees Fahrenheit probably will require some form of additional heat applied near the cooling core components at the rear of the refrigerator for it to operate properly. But rather than adding yet another droplight, packing insulation behind the refrigerator, or blocking off the lower vent openings, I contend that at temperatures well below freezing, you simply don’t need refrigeration anyway! Just put the lobster tails and prime rib in a cooler and set it outside! Once the ambient air gets closer to the freezing mark, then you can move the food back inside; the RV absorption refrigerator should operate fine at temperatures near freezing and above. 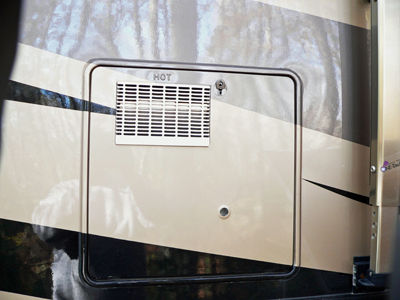 Try to position the coach where maximum sunlight can be directed onto the lower refrigerator vent at the side of the RV when operating the absorption refrigerator during cold weather. 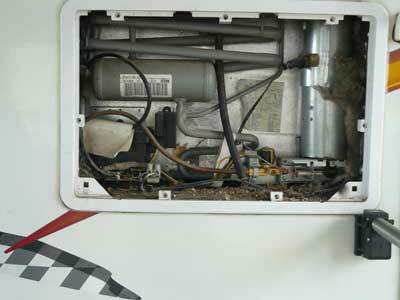 If you will need battery power to keep the furnace running during the cold winter months, ensure that all the batteries in the RV stay fully charged. A fully charged battery has a higher sulfuric acid percentage than a discharged battery. A higher degree of sulfuric acid means less water in the electrolyte. Less water content means it is less likely that the battery will freeze. Keep in mind that a fully charged battery will freeze only if the temperature dips to 55 or 60 degrees below zero Fahrenheit, while a discharged battery may freeze at or near 20 degrees Fahrenheit. This is a huge difference, and vital if you’re RVing in subzero temperatures! Verify that your battery charger has the ability to charge not only the house DC system, but also the chassis batteries if you have a motorhome. Not all converter chargers have that feature. 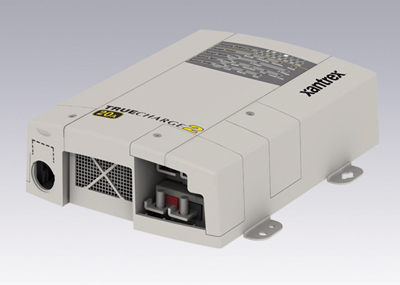 Some “smart chargers,” like the Xantrex Truecharge2 battery charger, may have multiple charging outputs. If not, you’ll probably have to rely on a stand-alone battery charger to keep the engine battery system up to par. Battery conservation while away from shore power is just as important as propane gas conservation while connected to shore power. 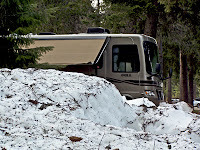 While it’s important to keep the RV sealed tight to keep the elements out, it’s also necessary to pay attention to the conditions around the coach, especially if snow is in the forecast. 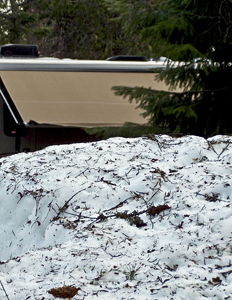 Always inspect the RV roof after every snowfall and keep the accumulation to a minimum. Avoid letting fallen snow cover the sewer vents, air conditioners, refrigerator roof vent, satellite or TV antennas, etc. With the slideouts extended during a wintry stay, tape 1-inch foam sheets to the exterior “roof” section of each slideout. Typically, the roof section of a slideout lacks the same degree of insulation found in the rest of the RV roof, and the added panels will help. If the slideouts are equipped with automatic awnings, the foam panels can add a little support in case of an overnight snowfall. Regarding the patio awning and individual window and entry door awnings, keep them fully retracted if snow or heavy rain is expected. When deploying any awning during the winter, keep one end tilted lower than the other in case an unexpected snowfall happens while you are away from the coach. Be sure to remove the white stuff as quickly as possible. Those who have shoveled snow before know that thousands of those feathery flakes can add up to some serious weight, putting stress on the awning canopy and supports. For that reason, I recommend retracting all awnings before going to sleep at night. If snow builds up around a motorhome, make sure you keep it sufficiently clear to prevent the exhaust pipes for the motorhome or the generator from becoming blocked, and to allow exhaust gases to dissipate as they should. Great expanses of wintry vistas await the less intimidated and more adventurous among us. Who knows? A winter RVing vacation or two may get you closer to becoming another satisfied full-time RVer. Enjoy and remember, RVing is more than a hobby; it’s a lifestyle!